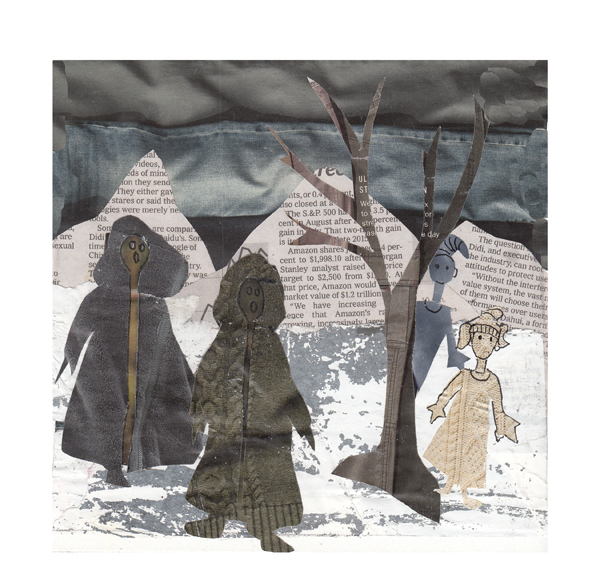 Miriam Bos is an illustrator and her paintings are used for books, magazines, fabric, ceramics, and greeting cards, etc. It was fun learning about her creative process, and for our homework we were asked to create a book character and draw at least 3 emotions. I have fun watching squirrels trying to sneak the seeds from the bird feeders at our friends' home in Martha's Vineyard. There were two who climbed the nearby tree, took flying leaps to the conical top of the iron pole holding multiple bird feeders, and almost never were successful. I called a squirrel with an orange tail "Spas" because he would try to climb down the pole, lose his footing, scramble trying to hold on, and then fall to the ground. What I Learned About Character Development in WHIMSICAL: In Miriam's demo video she showed us her method for creating characters. She obtains photo images of real animals from the internet, and then traces them to start the process. 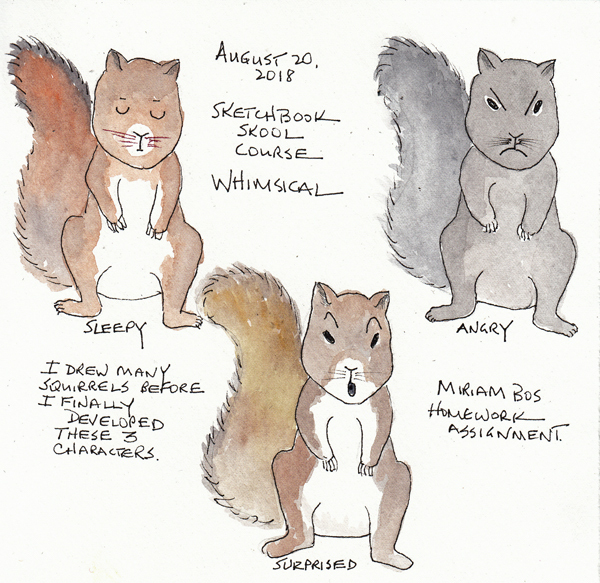 After she learns about their structure and characteristics from tracing, she sets them aside and begins to draw many versions of the animals in different poses, and with different emotions. She, like several of the other illustrators, said that they draw many before they find the character they like. Mike Lowery said he drew almost a hundred before he found the "Carl the Duck" character he wanted. I started with tracings, and then drew at least 20 before I found these characters. I had to paint one with an orange tail to remind me of the spastic squirrel I loved at the bird feeder. Vanessa Brantley-Newton is an illustrator of Children's Books, and her homework for us was to create a collage inspired by one of 3 words: Joyous, Dangerous, and Ridiculous. For my collage I decided to go back to the first moment that my characters Axel and Alice saw the characters in the hooded long coat. The title of this collage is DANGEROUS? Axel was created during a Sketchbook Skool homework assignment by Fabio Consoli. We had to intereract and draw with a child, and I created Axel, and then later Alice. The top painting is the original homework painting. The character on the right was created by my Grandson Zach, and then I reacted to the robot creating the rest of the painting. 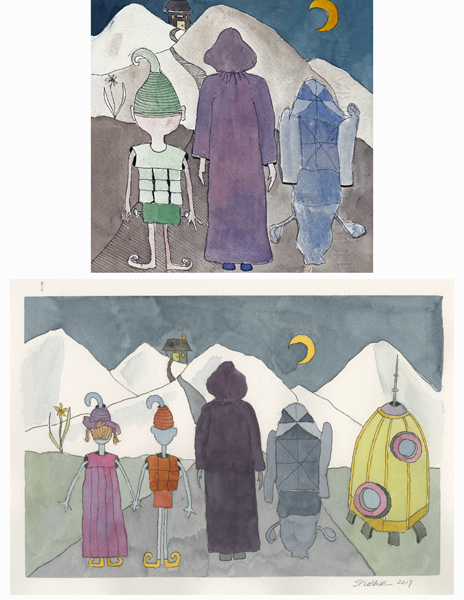 The bottom watercolor was done as a final project for a watercolor illustration class at FIT. It is hard keeping up with my art goals while being on vacation with my husband at the home of very good friends. I find that I am only able to do it by taking photos and painting during quiet times in the house. Only the bird feeder and the squirrel were painted "in the moment." 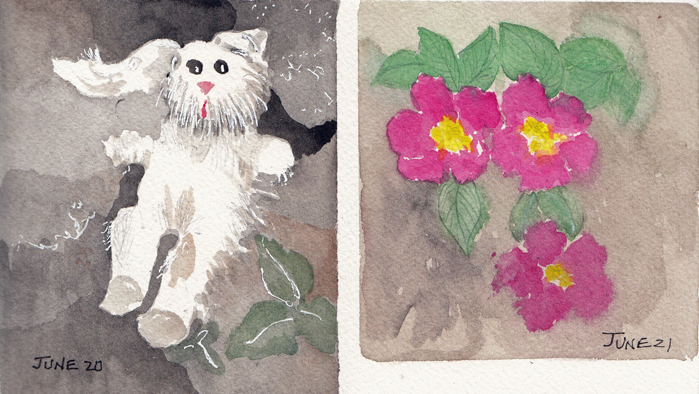 I am also trying to paint in my summer vacation sketchbook each day. It takes me much longer to do direct painting because I need to carefully plan the layers. The stuffed bunny was sitting among rocks at the Acquinnah Wampanoag cemetery on Martha's Vineyard. The Beach roses were photographed on the path we walked to the beach for our morning beach walks. 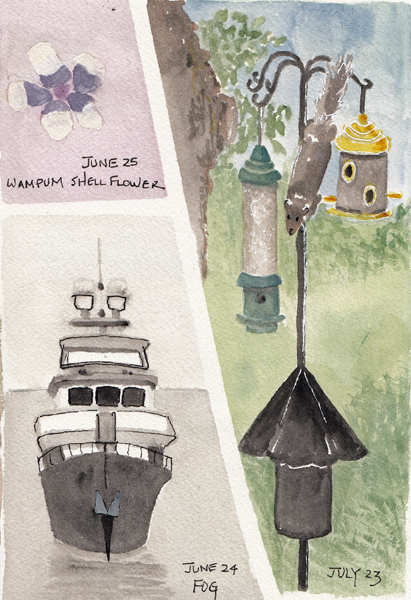 The wampum flower was painted from shell pieces I brought home from the beach. 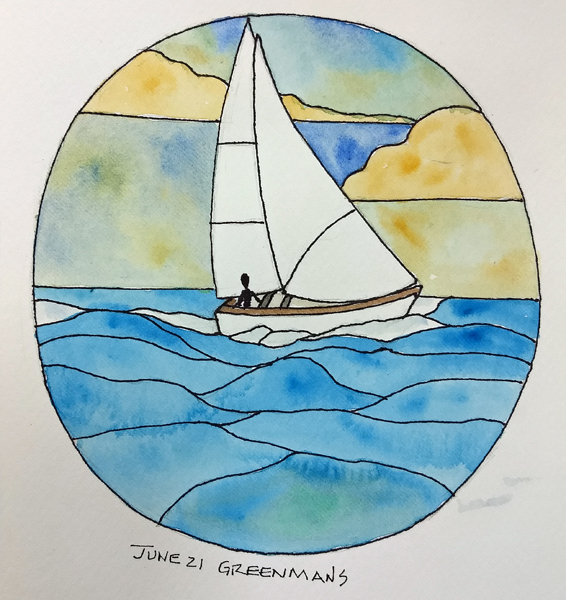 The yacht was photographed in the harbor in Vineyard Haven on a day we saw two movies and attended a Town Hall meeting by Senator Ed Markey. The bird feeder needs an air traffic control system - for constant bird visitors, and this squirrel who jumped from the tree to the top of the feeder, and then snuck down the pole to the yellow feeder to eat. We are enjoying our visit to Martha's Vineyard with some of our oldest friends. I have to fit in sketchbook pages whenever I can, and I'm now taking photos and painting from them later in the day. This is a beautiful stained glass window hanging that I look at each time I sit down in their home. 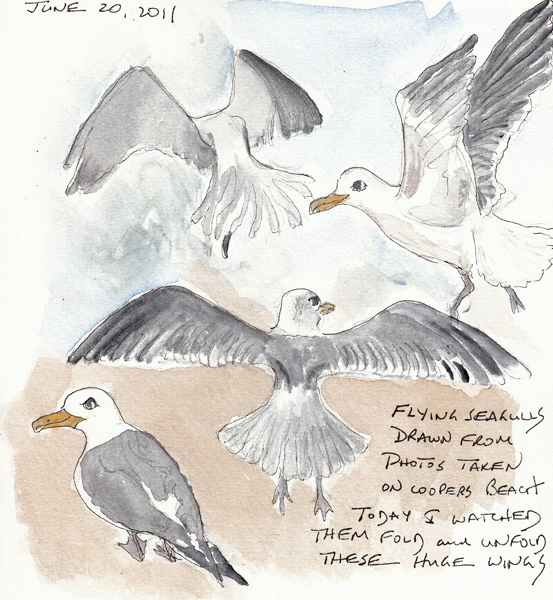 Painted from observation as I sat and talked. We are staying "up island," near the Wampanoag Indian Reservation. 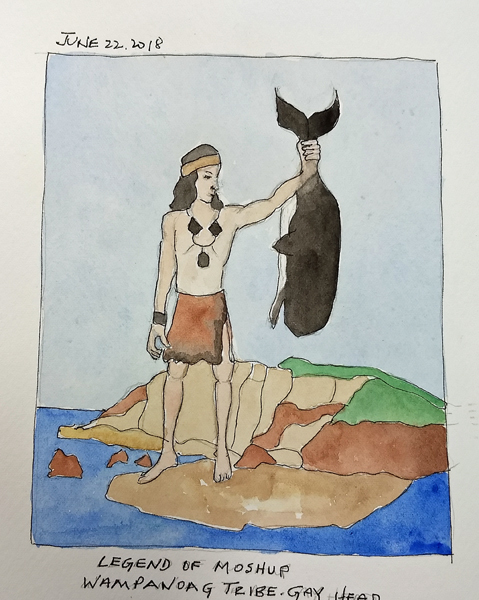 I saw this image on a tribe seal on the reservation truck, and learned the legend of the giant Moshup who caught whales in the ocean with his bare hands. He swung the whale into the cliffs to kill it to eat, which made the Gayhead Cliffs red. Boats waiting on the shore at Red Beach, Menemsha Pond. 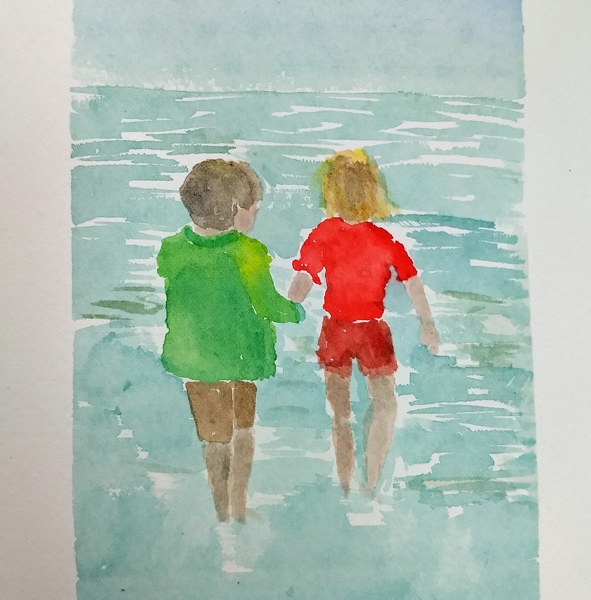 Two children in the surf, from an illustration. The waters are still cold, and we never see anyone in the ocean on our morning walks. This was done as a direct painting, but in my summer vacation sketchbook. It gets confusing! 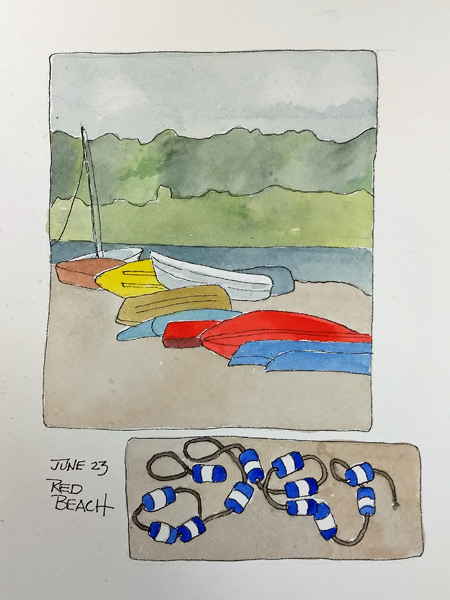 I am doing "direct paintings" for the 30 X 30 challenge in a different sketchbook, and will post them when we return home. After our beach vacation on Long Island, we are returning to Martha's Vineyard to vacation on another beach. Retirement is wonderful and the settings couldn't be more different. To record the move from the Hamptons to the Vineyard, two of my 30 X 30 paintings (direct painting/no lines) done while in NYC from my photos were of the lighthouses in both places. 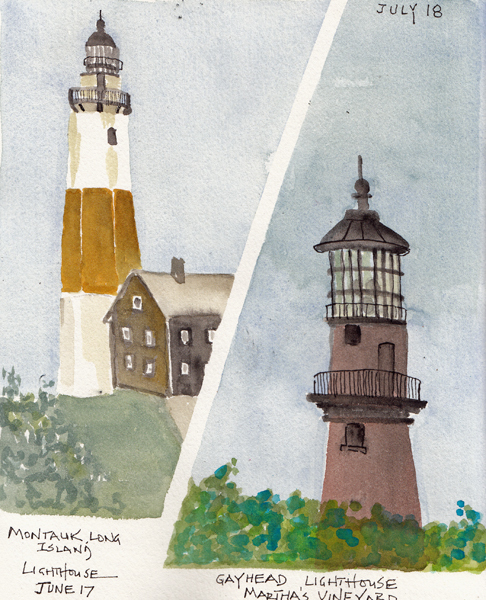 The Montauk lighthouse was painted, after I painted the sky as a negative space. Fun, and the type of challenge I needed. 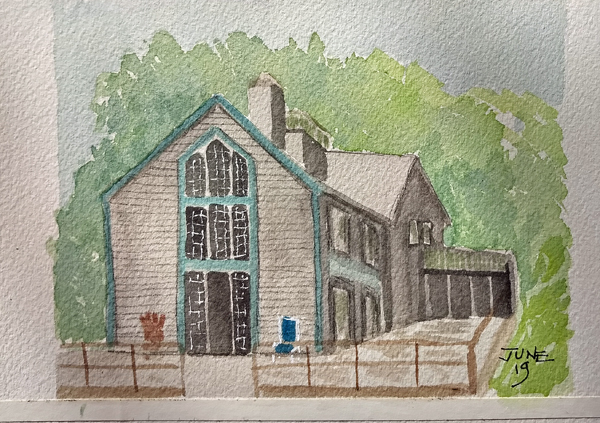 The house we will be in for a week, a direct painting from one of my photographs. Blog image photographed, not scanned. The beach at Acquinnah in Martha's Vineyard is rocky, with big rocks in the surf, and smaller ones on the beach. 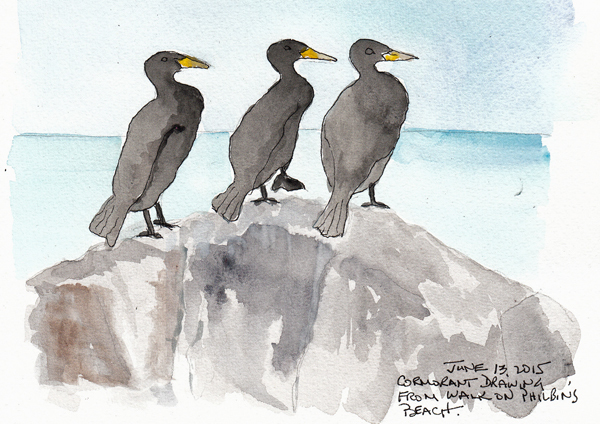 Near the cliffs at Gayhead there are several huge rocks in the ocean that are always covered with cormorants. 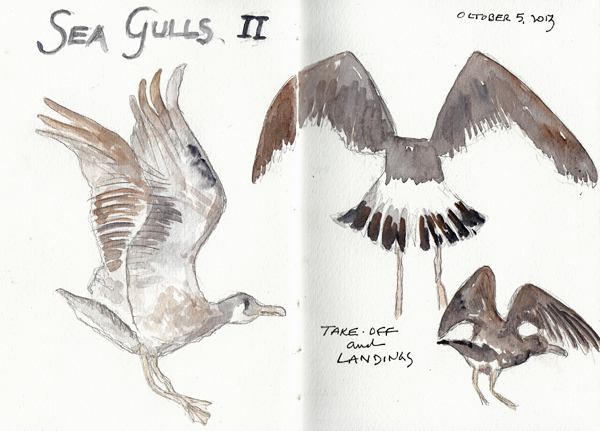 This is a sketchbook page of mine from a previous visit, but many were on the rock again yesterday on our beach walk. I'm embarrassed to admit that I didn't understand the flight of sea gulls until I started watching them take off and land on the beach. I love watching them run down the sand as if it were a runway, then unfold their two part wings, and lift off - finally tucking up their legs like jet landing gear. 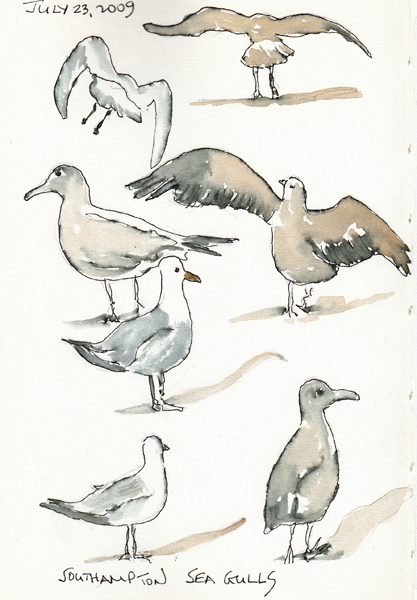 I try to take a few pictures, and draw the sea gulls from photos taken during our morning walks. Here are some from years past. 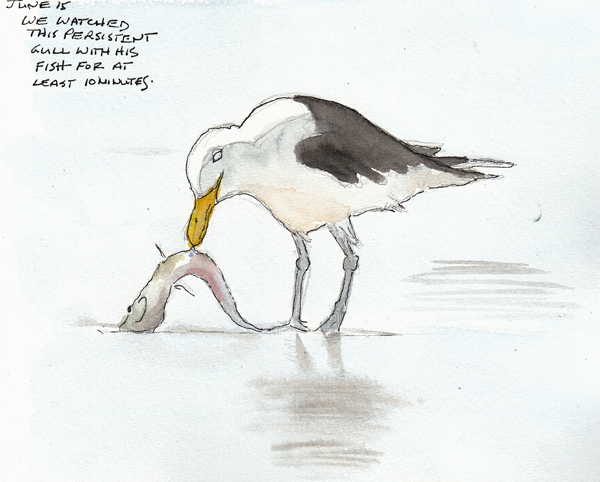 We watched this gull fighting with a fish on Martha's Vineyard, and my friend was able to capture several terrific photos with her telephoto lens. I painted it several summers ago from the photo.